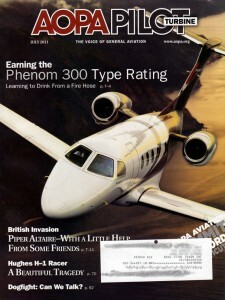 That’s the title of the July, 2011 AOPA Pilot magazine (turbine edition) cover article. It seems that the author, Thomas A. Horne, took the Phenom 300 initial type rating course at Simuflite’s Dallas training center shortly before I arrived for the Gulfstream IV program. 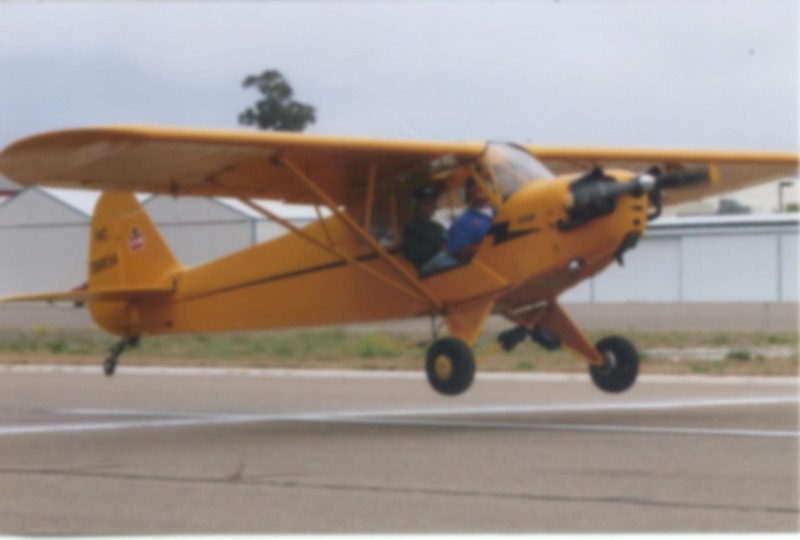 Horne’s impression of Simuflite and the training course were very similar to mine, right down to photographs of the classroom, simulator, Simfinity procedures trainer, and avionics trainers which accompanied the article. Makes me wonder how many other turbine type rating course journals are out there on the World Wide Web. I performed a fairly thorough Google search before I departed for Dallas just to see what I was in for, but, aside from the John Deakin articles on AVweb, came up empty. That was part of the reason I wrote about the experience. The Phenom 100 and 300 are interesting airplanes. They’re clean-sheet designs from the Brazilian aerospace company Embraer. Until recently, Embraer was primarily a maker of small airliners, but several years ago they jumped into the VLJ (very light jet) market with both feet, and have achieved considerable success against the Citations, Learjets, and other traditional light jet aircraft. I see the Phenom 100 around Southern California quite frequently. 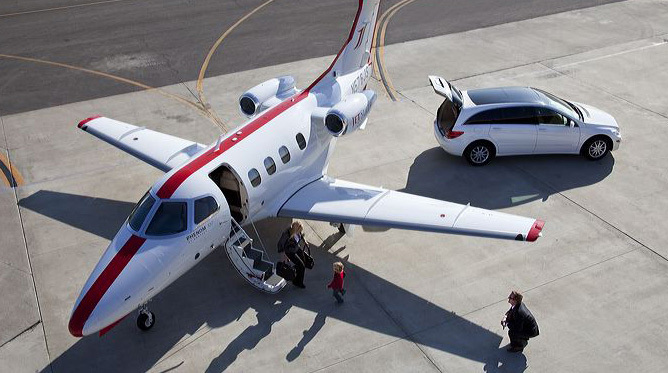 Typically, I’ll find one parked at Signature Flight Support at SNA or over at the Mercury Aviation FBO in Long Beach. Primarily, these are JetSuite charter aircraft, easily recognizable with their distinctive red racing stripe running along the upper longitudinal axis of the aircraft. From what I can see via their Facebook page, they’re expanding rapidly as a “no frills” charter operator. I’ve seen them advertise one way flights from Orange County to Phoenix for as low as $499, however I’m not sure that’s for the whole airplane. It may be for filling in empty seats on an upcoming flight. I’m not sure. If you’re going to start a charter company during the worse economic environment since the Great Depression, this is a smart way to do it. I’ve got a couple of friends who work for JetSuite, and they seem to love it. Anyway, the Phenom 100 is a fairly common sight in these parts. The 300, however, is a newer, larger aircraft, and as far as I know there aren’t too many of them out in the wild just yet. At Simuflite, one of the Phenom simulators — I can’t remember if it was a 100 or a 300 — was located in a bay directly adjacent to the Gulfstream IV on which I trained. Likewise, a Phenom classroom was right next to ours on the third floor of the Dallas facility. As a result, I noticed the goings on over there, and it seems to me that things were always busy in Phenom-land. It’s that last bullet point which really intrigues me. Solo flying has always been a great passion of mine; being alone up there in the wild blue yonder with nothing but your trusty steed! Um, and in this case, a million dollars of avionics hardware, I guess. Okay, so it’s not as romantic as barnstorming across the country low and slow in an open cockpit biplane. Still, it must be a hoot to be master of your own domain in an aircraft so capable. Other airplanes approved for single-pilot operation tend to be slow, altitude limited, diminutive in stature, or lacking in some other way. The Phenom tops out above 40,000 feet and although it’s not as fast as a Gulfstream, it’s still respectable. The range is short enough that you don’t need the stand-up cabin of the larger jets because you’ll be on the ground within three hours anyway. The single-pilot approval might be a moot point for the bulk of Phenom operators due to insurance or other requirements. 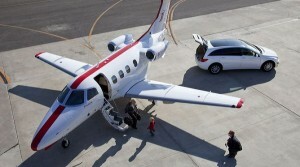 The JetSuite airplanes all fly with two pilots. Still, it’s a nice option to have. I’m couldn’t be happier about moving into the G-IV, but if I was out there just looking for a gig, I could think of far worse things than zipping around the country in a little Phenom with new-airplane smell.